The world's smallest guitar is of the size of a red blood cell.It was developed by scientists from Cornell University.USA. 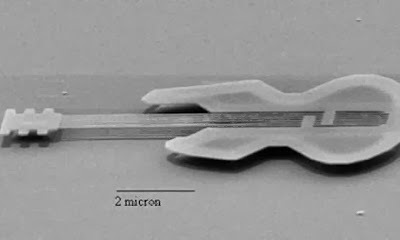 The nano guitar was made from crystalline silicon.It is about 10 micrometers long.It can be viewed with the help of an electron microscope. The nano guitar has six strings each of 50 nano meters wide.When plucked by an atomic force microscope ,the strings would resonate.But it will at be inaudible frequencies. The first of its kind was made in Cornell University in 1997. It's so small, People can't even see it without a microscope.. OMG.. I wanna see it..
Wow! Really fascinating creation, imagine looking at a guitar using a microscope will really keep you interested. Glad I view web page and was able to discover new things.